For some years Queensland’s Weapons Licensing Branch have maintained the position that sound suppressors are not available to farmers and shooters (click here for history) as a means of hearing protection. Last month, Queensland’s Civil and Administrative Tribunal demolished that position. A Queensland farmer who shoots feral pests from the cab of his tractor wanted a suppressor for occupational health and safety. In simple terms, even very intermittent use of firearms is attended by a very real risk of permanent hearing damage. Even more harmful to hearing than is the noise component of the report of a gun is the accompanying explosive blast (or ‘impulse’). This is reputed to generate up to 1,000 times more pressure than does the noise component of the gun’s report. Personal Protective Equipment (‘PPE’) in the form of either earplugs, or earmuffs, whether used alone or in combination, may reduce noise exposure by approximately 20 – 30 decibels. Yet, for the majority of long-arm weapons, PPE of that type is insufficient to attenuate noise below dangerous levels. The original decision observes, correctly, that section 3 of the Act specifies that weapon possession and use are matters that are to be regarded as subordinate to the need to ensure public health and safety; and that public health and safety are matters that are deemed to be enhanced by means of strict controls over weapon use, storage, and carriage. Next, the original decision maker observes (again correctly), that Part 4 of the Act requires a person to be licensed to use weapons and notes that, other than in the case of collectors and dealers in weapons that have first been rendered inoperable, there is no ability under the regulatory scheme to become the holder of a licence for a Category R weapon. That too is true. It is an axiomatic statement of the general position. However, the error arises in having concluded that these trite observations – coupled then with a further observation that the operators of pistol ranges could implement design modifications to attenuate sound (something that is not even relevant to the present application) – afford grounds to refuse [the] application for an exemption. Although ultimately a matter for the Legislature, it bears comment that the evidence heard before the Tribunal in this matter suggests that the desirability of continuing to include suppressors within Category R may be questionable, particularly in circumstances where all of the other items in that category are military-grade weapons. Weapons Licensing Branch have lodged an appeal against QCAT’s decision and that will take some months to be heard and determined. Because the exemption power is very broad, it is difficult to see what the basis for a successful appeal might be. 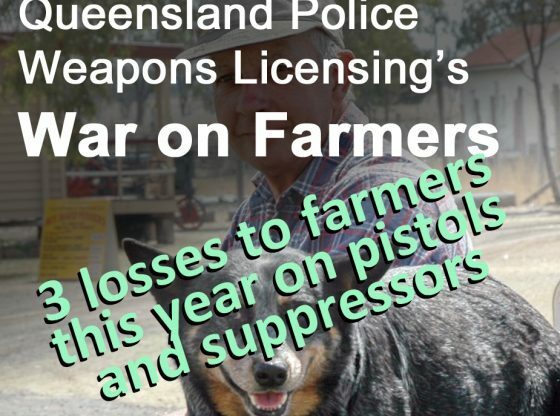 Perhaps Weapons Licensing and Queensland Labor just hate farmers? We’ll have to wait and see. The applicant in this case was very well prepared and lodged a range of reports – including an OHS report specifically about noise hazards at his farm – that illustrated his genuine need for a sound suppressor. Witnesses were available to speak to the reports and explain the basis of hearing loss risks documented in the reports. This win is a landmark decision that illustrates the real need for suppressors and the capacity for farmers to access them in Queensland for improved health and safety. Weapons Licensing have been very hostile to farmers on sound suppressors and on pistols to control feral pests. However, QCAT has overturned them three times this year. The previous two decisions (on pistols) are covered here. Weapons Licensing has been taking an inflexible, thoughtless attitude and it’s gotten to the point that courts and tribunals are listening carefully to reasoned arguments and finding Weapons Licensing’s positions irrational. So you want to lodge an exemption application? Who’s afraid of the big bad gun lobby?